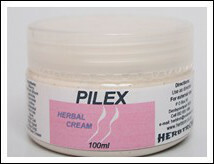 Our Pilex cream are formulated to help with haemorrhoids and also benefits varicose veins. Ingredients: Bilberry, Butchers Broom, Calendula, Chamomile, Comfrey, Goldenseal, Gotu Kola, Neem, White Oak, Witch Hazel, Yellow Dock and Mineral Base Cream. For best results use in conjunction with Pilex drops.